The Navrang Show on KTRU 90.1HD2 & ktru.org: Program on February 28, 2009: An educational session on ktru by Guru Pandit Suman Ghosh, disciple of Padma Vibhushan Pandit Jasraj. The radio show with the greatest variety of music from the Indian subcontinent! Program on February 28, 2009: An educational session on ktru by Guru Pandit Suman Ghosh, disciple of Padma Vibhushan Pandit Jasraj. 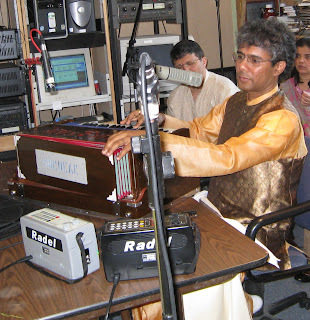 Pandit Suman Ghosh gave lessons on Hindustani (North Indian) style of singing. Can a recording of the show be made available online for those of us who missed it ? Music India Online, MIO for short, great collection of online Indian music in realaudio, well-categorized and searchable. Asian Underground: Fusion of various Indian styles, and electronica, with Western beats and genres, originating in 2nd generation communities in UK, US etc. Bollywood: Amalgam of Bombay + Hollywood, referring to India's immense Hindi film industry, churning out musical melodramas by the hundreds, also the source of most popular music. Please feel free to correct any errors!